On Tuesday, the Patriots unveiled their brand-new NFL Color Rush uniform! The all-navy duds are the team's first new outfit since 2003, and will be worn in Week 3 against the Texans on Thursday Night Football. While they're not bad, they aren't great, either. Many reviewers criticized them as a bit bland and uninspiring, and to be fair, they have a point. While the shoulder striping is new and a nice touch, and the inside collar says "We are all Patriots," the rest of the jersey looks like the Pats' standard home threads with navy pants added to the ensemble. Even weirder, the Texans, are scheduled to wear white (instead of their normal color rush uniforms, which are navy as well). So now, there will be one team in color rush uniforms and another in normal white uniforms with reduced shoulder striping. Get hype! While they're cool, the Patriots' new color rush jerseys aren't exactly groundbreaking, and it would have been nice (as Paul Lukas of Uni Watch noted) to incorporate Pat Patriot somehow. Overall, I would grade the threads out at a C+ : not bad, but they could have been easily improved--how about red instead of navy? As Bill Belichick would say, though, it doesn't matter what New England is wearing so long as they get a win in it. 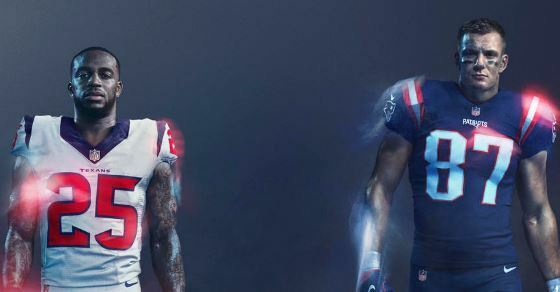 Tune in to see the new unis on Thursday, September 22, and watch the Patriots defeat J.J. Watt and the Houston Texans!